TJ Leadership has made a positive impact on both TJ and the broader Denver community this year. Over the course of this school year, TJ’s Leadership class has been hard at work providing unique experiences and projects for our beloved school in addition to the broader Denver community. 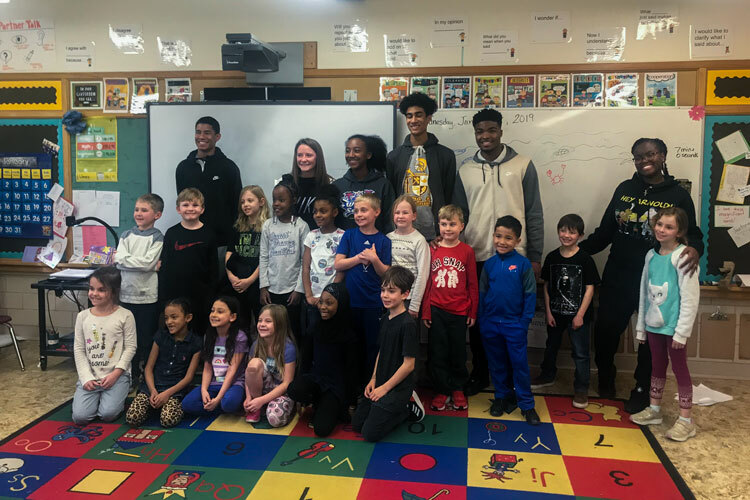 The Leadership class, led by Assistant Principal Jonathan Poole and counselor Erin Thompson, has led a variety of projects targeting surrounding elementary schools in the Denver area with a focus on promoting positive messages within younger pupils. In this semester alone, Leadership has regularly participated in biweekly Peaceful Schools events at elementary schools (Samuels and Bradley) by reading and interacting with first and second graders, as well as participating in the weekly Totes for Hope events, where Leadership students provide certain students at Samuels with totes of nonperishable food every Friday. The Peaceful Schools program, founded by the YMCA of Metropolitan Denver and the Denver Rotary Club, was created with the intention of abolishing bullying by promoting positive social skills and empathetic behavior within the young students of Denver. By providing of a platform in which teens can mentor young students through positive messages in books and other activities, the young students benefit by learning how to resolve conflict in positive ways and treat each other with kindness. In turn, these interactions and lessons help foster an environment in which bullying amongst youth ceases to exist. In addition to benefiting the elementary students, the Peaceful Schools program has positively impacted TJ students in its rewarding nature. “It’s great to be able to go to our neighboring elementary schools to help out. It’s fun seeing how much the kids enjoy us being there,” explained senior Jaelyn Jackson. In addition to the Peaceful Schools program, Thomas Jefferson’s Leadership class has expressed impressive involvement in Totes for Hope, a program in which every Friday during eighth period, Leadership students pack a variety of nonperishable food items for Samuels Elementary students and families in need. TJ Leadership’s involvement in the broader Denver community doesn’t end there: every other Friday, Leadership attends Jiminy Wicket, a program in which high school students play croquet with elderly community members who suffer from Alzheimer’s disease in order to foster a positive connection between generations. In conjunction with their work outside of school, Leadership also leads unique projects (assigned to groups of students every six weeks) for the immediate TJ community such as school dances, fundraising events, or other activities. “My favorite part [of Leadership] is seeing the kids actually complete their projects and be happy and proud of the outcomes,” explained Thompson. As evidenced by the immense amount of work contributed by Leadership over the course of the 2018-2019 school year, it is safe to say that Thomas Jefferson High School’s Leadership class is truly the heart and soul of the TJ community, bringing together students, staff, and Denver citizens alike.